…Montana! Ha – I’ll bet you thought I was going to say M is for Marci! But I didn’t – I know, shocking, right? Well, it still is for Marci, but as I initially stated, M is also for Montana. Which is where I went just a couple of days after Chris and I returned from Alaska (July 13-15). I flew out to Kalispell, which is just outside of Glacier National Park. I’d only driven through Montana once, several years ago, so the whole place was pretty much new to me and I will say that I quickly learned that M is also for Magnificent. Yes, Montana is indeed Magnificent, Majestic, Marvelous, and M-pressive! My trip was only Tuesday through Thursday, and much of the time was spent in a meeting room in Whitefish, just a stone’s throw from Kalispell. I was there for a bull trout recovery planning meeting and while it was slightly dry (as opposed to wet, which fish tend to need), our group did get outside one afternoon for a drive up Grave Creek in the Kootenai watershed. 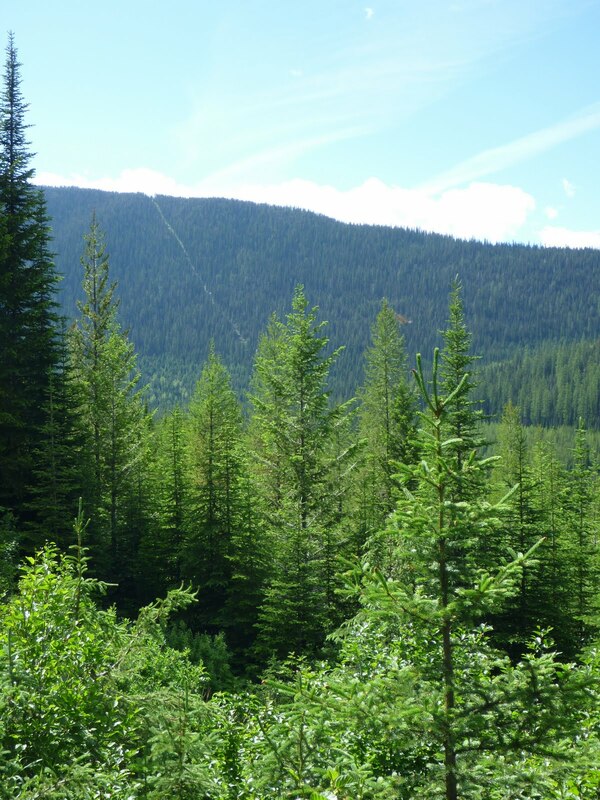 We were only a few miles from the Canadian border, which you can see in this picture – there’s a line cut through the trees to mark the interface of our countries. How’d you like that job, trekking through some of the most rugged land in our continent to cut down and maintain a tree-free line? The Canadian border from the headwaters of the Wigwam Basin. The following day I was able to spend a couple of hours driving around the south end of Glacier National Park. I found Lake McDonald and the views of the mountains particularly stunning, but the drive through the forest was interesting too. 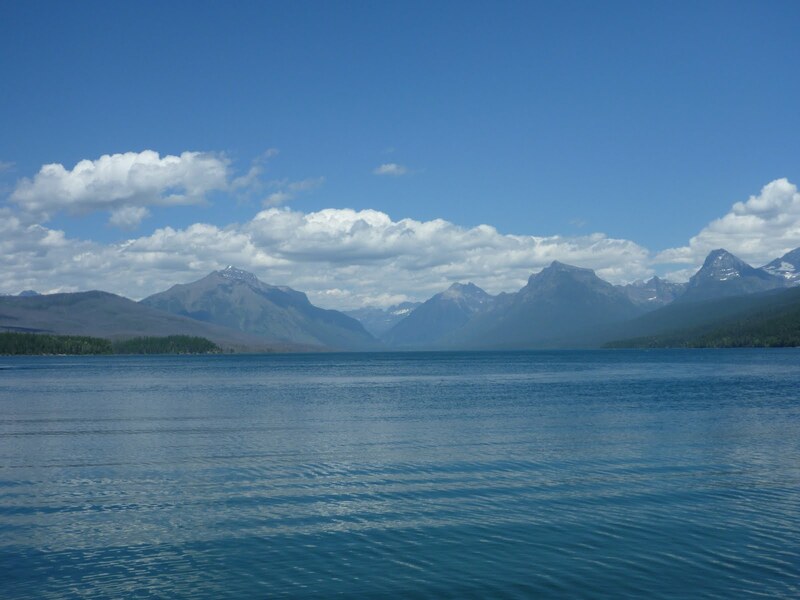 Lake McDonald, with several peaks in the background (from left to right, Mt. Vaught, Mt. Cannon, Mt. Brown, Little Matterhorn, and Edwards Mountain). Large portions of the forest had burned in wildfires which made the trees look like skeletal toothpicks – you might think this would be not so picturesque, but you could see the topography of the landscape really well instead of just driving down a thickly wooded corridor. 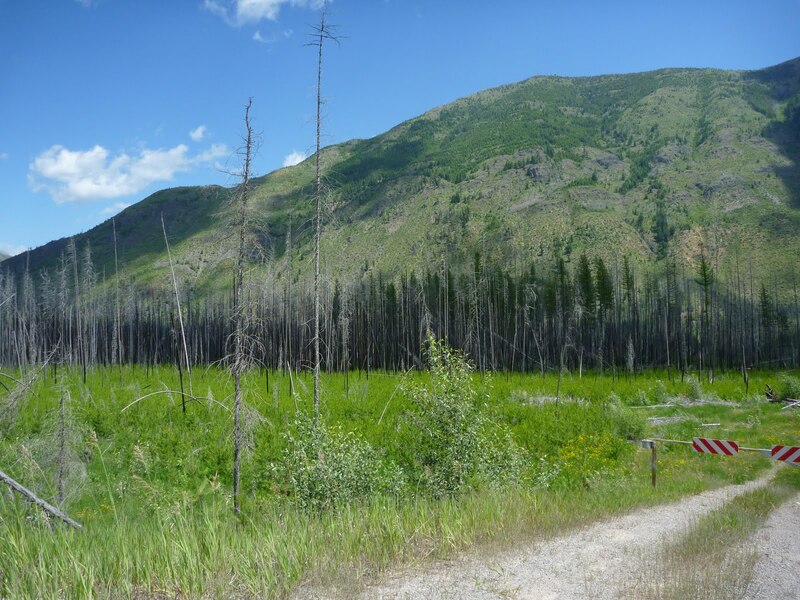 Additionally, seeing the forest regenerating with new growth and baby trees was a reminder that forest fires are a natural part of ecosystem processes, and that they benefit the native species that have evolved to survive with fire as a part of their environment. One of the burn areas. Note the burned, branchless trees in the background; the vibrant green groundcover is nearly a monoculture of lodgepole pine treelings that are about 2-3 feet high. Anyway, the water there was incredible – aqua blue from the glacial till – and we took advantage of a shady spot next to the Flathead River to enjoy lunch (I accidentally left my prescription glasses there and had to return for them after realizing they were missing a half hour down the road…oops!). 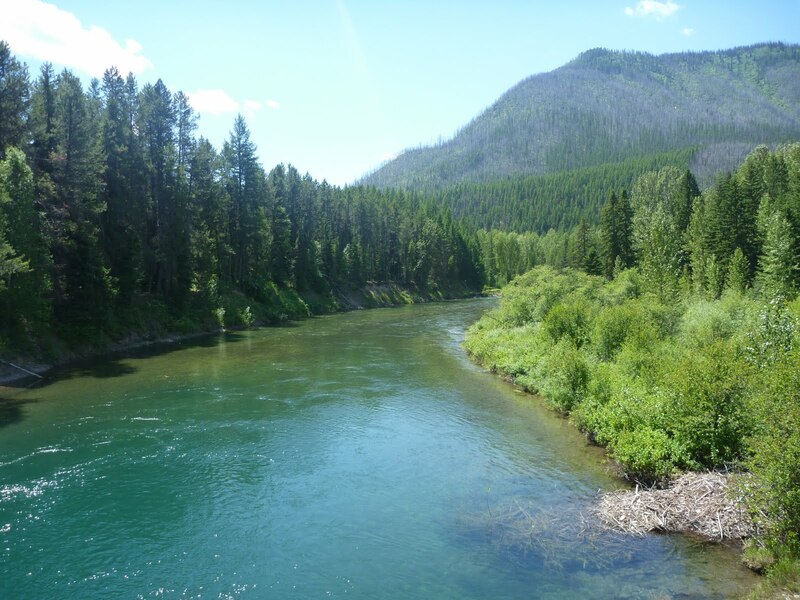 I’m glad I got to see the area, and now I understand why bull trout like to live there! « A is for Alaska!